The company’s objective is to serve clients demanding in connecting with high speed circuit into the oversea. Therefore, the company had proceeded until got the license for telecommunication business of type No.3 in order to provide International Private Leased Circuit (IPLC) service, as well as the license for International Internet Gateway (IIG) service and National Internet Exchange (NIX) service of type No.2. is the International Private Leased Circuit in which the company’s network, as a starting point, does connect directly to network of service providers in the oversea, and pass through the client’s terminal point by using DWDM and SDH Technology as main network. Meanwhile, the technology of SDH, EoSDH, and TDM are used for network service. These are depend on client’s demand and lease of speed by ranging from 64kbps – E1, DS3, STM1 to STM64 which provided high secure network and guaranteed in transferring speed of video and audio data with correctly and constantly. IPLC Service is suitable for multinational organizations, either big or small size of organization that wants to connect with the other counties as well as connecting with the international leased circuit and digital broadcasting providers of TV satellite. is a service of virtual telecommunications circuit, which is used for international communications via company’s network in order to connect with traffic managing device and network service providers in abroad. Therefore, users can reach to the video and audio data transmission properly, and get secure communications same as IPLC Service, however, the different is the traffic managing technology. IP technology is used for managing traffic. As for network service, client can choose either EoSDH or Ethernet, which offered speed is ranging from 64 kbps to Gigabit Ethernet. This service is appropriate to the same customer group of IPLC, however it is depend on speed and technology that they have chosen. are the internet data communications services for connecting with internet service providers in both domestic and international. IP Transit Service is to connect with multinational internet data by using network in Thailand as a hub. The company aims to offer these services to both domestic and international service providers as well as mobile phone and broadband service providers. Cloud Direct Connect Solution is the service connection from the client’s office directly to the Cloud Service Providers instead of using only the internet connection. Symphony Communication and “Megaport”, the global leading provider of Elastic Interconnection services, provide direct connection to Cloud Service Providers such as; Amazon (AWS), Microsoft Azure/Office 365 and Google Cloud Platform. The service highlights are safe of stored data and high efficiency performance, as it provides a Private Link connection which is dedicated to each client and can be connect to a wide range of Cloud Service Providers in various form at the same time, it helps reduce the slow data transfer speed due to it does not need to share internet bandwidth with other clients. Symphony Cloud Direct Connect Solution is ready to serve with SLA (Service Level Agreement) 99.9% to ensure our quality of network. Symphony Communication and “Megaport”, the global leading provider of Elastic Interconnection services provide “Symphony Cloud Direct Connect Solution” allow a dedicated private network connections from your company to any cloud service providers you prefer. Our services can help you safe stored data and high efficiency performance with higher SLA 99.9%. 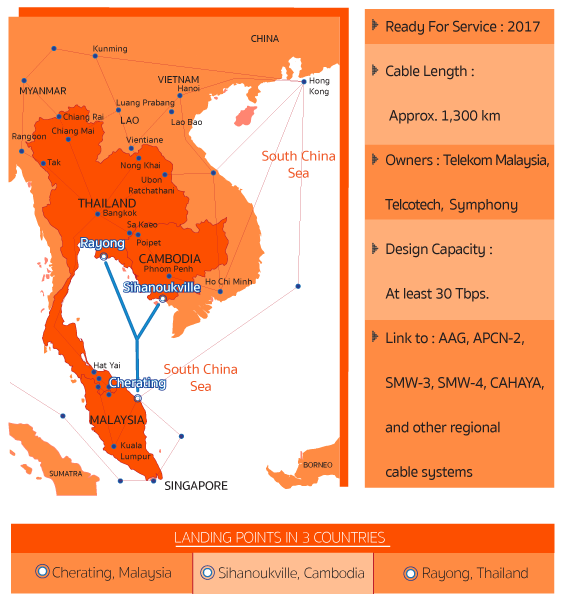 MCT Submarine Cable System is one of the highest capacity cable systems across Asean due to this network will connect MALAYSIA, CAMBODIA and THAILAND (MCT) with a total capacity exceeding 30 Tbps. and support 100G Ethernet Technology. This project is comprising Telekom Malaysia (Malaysia), Telcotech (Cambodia) and Symphony Communication Public Company Limited (Thailand), spanning 1,300 km. length among 3 countries establish connection between Cherating in Malaysia, Sihanoukville in Cambodia and Rayong in Thailand. By early of 2017 this high speed submarine cable infrastructure will be ready for commercial service, the network would offer our neighbouring countries increased international bandwidth between major cities in ASEAN. 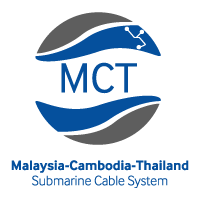 MCT provides state-of-the-art subsea network between Malaysia, Cambodia and Thailand through its massive bandwidth for clients and offers the connectivity from ASEAN to many continents around the world and Symphony Communication is Thailand 1st private company who invested in submarine cable system. MCT will deliver the best performance for interconnection between country-to-country and city-to-city across ASEAN with cost efficiency due to its design and professional operation Telekom Malaysia, Telcotech, Symphony Communication and Huawei Marine, the significant expert for submarine cable system. 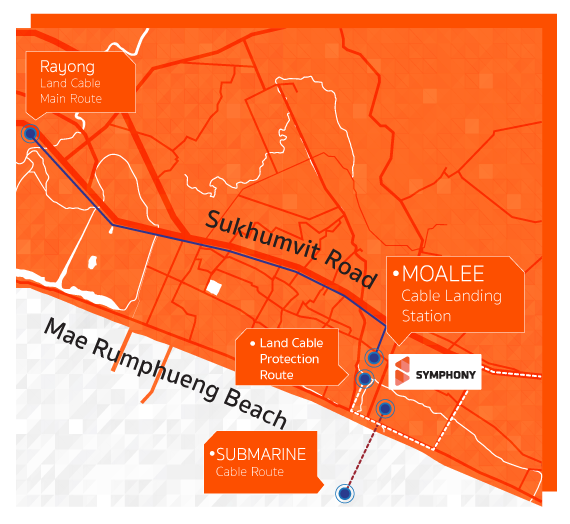 Located in a great location on Mae Rampueng Beach, Rayong, MOALEE Cable Landing Station, a newly built has approximately 2 rais with 2,000 square meters building space that has a great system and full support we provide for MCT i.e. power supply, security, monitoring, backup routing and can be a neutral opened access for other 3 submarine cable systems to connect and use this high capacity subsea network is Thailand for efficient interconnection.